Yep, there’s about a half-dozen comic book characters going by “Cutthroat”. *This* one is from the Savage Dragon comic books, originally from Image and now published under the Highbrow imprint. 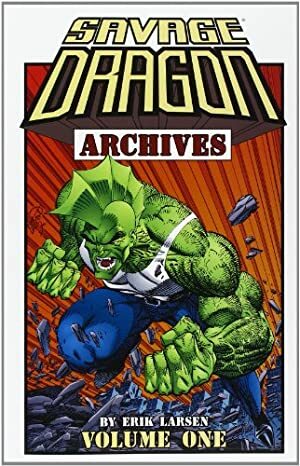 The “Savage Dragon Universe” is a stand-alone super-hero setting, thought it had many many many crossovers. 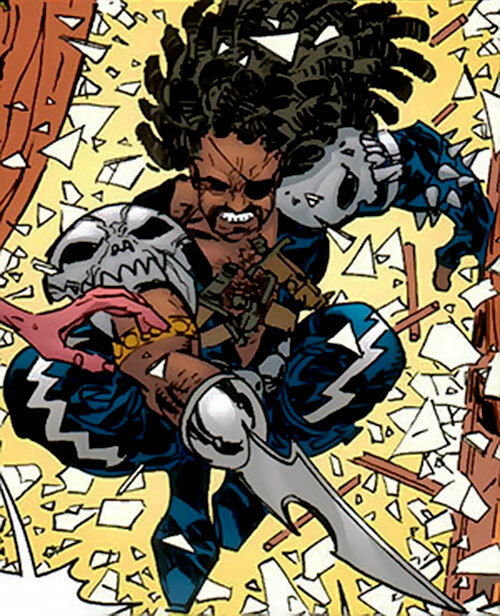 Cutthroat appears in the very first The Savage Dragon issue (in 1992), and has continued to pop back as a baddie all across the 1990s and 2000s. He’s a convenient super-legbreaker, physical fighter type. Known Relatives: GlowBug (wife), unnamed son. 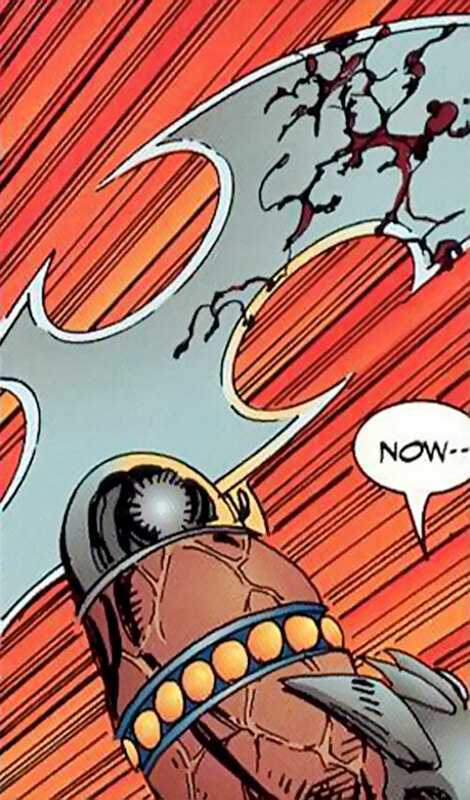 Cutthroat has “Class 2” superhuman strength, and is somewhat bullet proof. He is a capable melee combatant able to take on normal police officers with little trouble, but will succumb to experienced superheroes. He is also an expert at his hand blade weapon, à la Razorfist. In addition he uses complementary, smaller knives, in his left hand or for throwing. He is also capable at other weaponry, but prefers melee weapons primarily. Cutthroat likes to taunt opponents in combat. By doing so, he often manages to give the impression that he is tougher than he really is. Back in the early days of the Dragon’s career as a policeman, he was busy gathering up the freaks that had previously been unstoppable and were running loose in Chicago. Cutthroat was one such villain. He was forced to surrender after his girlfriend, GlowBug, was punched unconscious. Cutthroat realized that Dragon was out of his league. During the prison breakout at Stronghold Penitentiary a few months later, Cutthroat passed the still incarcerated Hardware. The villain had been attempting to get an early release by offering to testify against OverLord. This earned him a summary execution by his Vicious Circle teammate. He and the rest then rejoined the criminal organization. Following the initial clash between Dragon and OverLord, the super powered policeman had gone missing. OverLord dispatched two of his assassins to locate the hero and eliminate him before he got a chance to recover. Cutthroat and HellRazor tracked down the wounded officer but still were defeated. The Dragon broke Cutthroat’s leg. After another clash with the Dragon which resulted in his apprehension, Cutthroat fought his way back onto the streets when CyberFace asserted control over the Vicious Circle. He had masterminded another escape at Stronghold which near-replenished the group’s ranks. The villain, together with the Rumble Brothers, later clashed with She-Dragon. But that just left him arrested once more. The Vicious Circle’s miniature members released all of their imprisoned associates which then allowed Cutthroat one final shot at Dragon. He targeted him when he had retired from crime fighting but still ended up getting defeated. Cutthroat was not seen again but would have been rendered powerless by the Nega-Bomb detonated by DarkLord and the Covenant of the Sword. 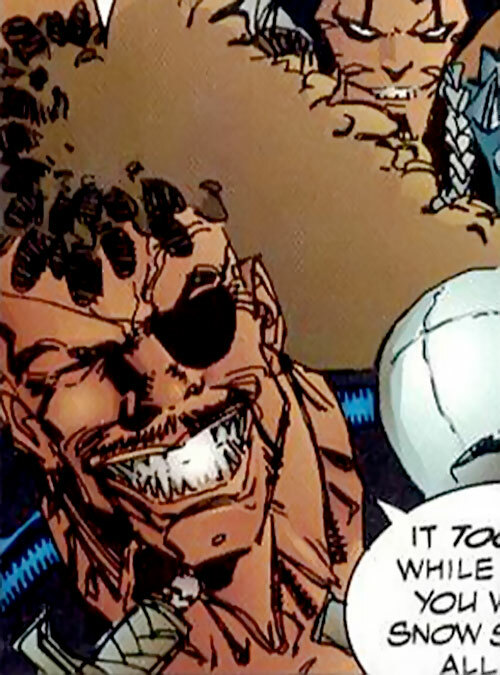 He was later killed when Universo consumed the entire Earth, in 2003. But a new version of Earth was then created. On the Savage world, however, history took a different turn. Cutthroat had remained a loyal operative of OverLord right up until his death. Due to the changes to this timeline, CyberFace had never been apprehended. Thus, his Annihilators were able to breach the Vicious Circle’s defenses. As a result, OverLord was eliminated. This caused a schism within the ranks. A faction broke off from the primary division of the Vicious Circle. Cutthroat was among them. He and his colleagues were soon feeling the pressure of their decision when CyberFace conquered first New York City and then the entire Earth using the technologies of the Martians and Cosmic Cops. Cutthroat and the rest of this discarded Vicious Circle group were left behind in the devastated Chicago where they were cut off from the resources of their parent organization. The abandoned Vicious Circle lost some of their members over the next few years due to the hardship of life within Chicago. They were in shambles and led by HellRazor when their enemy the Dragon recruited them for revenge against CyberFace. Cutthroat was present in the raid on the White House which ultimately led to the defeat of the world’s ruler. He then suffered the same fate as all of his criminal companions when the newly-reformed Liberty League shrunk them down. The Vicious Circle members were then all locked away. But a massive breakout at Stronghold Penitentiary meant that Cutthroat was able to return to the streets. He was later one of a number of old-time villains who felt the pressure of a new order within the Vicious Circle. Cutthroat was pressured into trying to kill Dragon but failed as usual. This latest loss destroyed what was left of his motivation. As a consequence, he accepted the hero’s offer of assistance in reforming. In this way he could properly provide for his new wife, GlowBug, and his son. Cutthroat is a muscular, Black male with a brutal look. He has a large blade weapon instead of his right forearm, and three knives in holsters on each side of his bare chest. He has a black patch over his left eye, and a mustache. 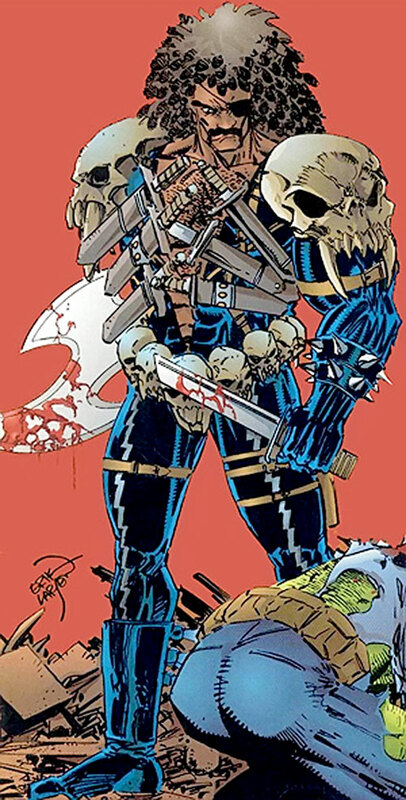 He wears a belt consisting of small demonic skulls, with an extra large skull covering his crotch and large shoulder pads of the same skull variety. He wears two additional knives in holsters on the back of his arms, one knife on his right hip, two more on his left and a pair of blue combat boots. The rest of his body is covered in blue spandex with vertical lightning bolts along the legs. He looks tough, but frankly, he ain’t as tough as he looks. Cutthroat is a brutal mercenary at heart. And he does have a cutthroat personality. He has no trouble with killing opponents using his various blade weapons, although violence is the means to an end. He likes to humiliate opponents and will laugh when facing inferior opponents. Still, he remains tough even against superior opponent. He will not disclose that he knows that he will loose, and instead tries to intimidate his opponent into defeat. Defeat is no deterrent for him. He will return for sweet revenge later on. He is a good team player, feeling no real rivalry towards his teammates, and will flawlessly follow orders. He seems to prefer working as a duo. He joined the Vicious Circle to gain money through robberies. Money does seem to be his goal in life. He also seems intent on raising a family with GlowBug after achieving such richness. As he got older, he felt that the Vicious Circle was only using him and that a life of crime no longer worked. After members of the Vicious Circle attempted to kill him he reluctantly decided to reform and to help the law-enforcement agencies instead. Cutthroat is a minor, but well-known villain, and can be inserted as he is. He would have fought the Batman a few times and been working with a few of the Batman’s Rogue Gallery villains. Cutthroat would have been part of Lex Luthor’s new Secret Society of Super Villains as a veteran criminal. GlowBug (High), The Vicious Circle (High). MPR (Missing left eye, Large blade instead of a right forearm and hand), Secret Identity, Dependent (GlowBug – 0 points since she’s capable enough). HAND BLADE [BODY 08, EV 05 (09 w/STR)]. Combat knives (x11) [BODY 08, EV 04 (08 w/STR)]. Close Attack 4, Improved Critical (hand blade), Power Attack, Takedown. Athletics 2 (+8), Deception 4 (+5), Expertise: Criminal 4 (+5), Insight 3 (+4), Intimidation 5 (+6), Perception 4 (+5), Persuasion 4 (+5), Ranged Combat: Thrown weapons 8 (+11). Greed Cutthroat is primarily motivated to commit crimes for money. Responsibility Cutthroat wants to take care of his wife and child. One Eye Cutthroat does not have a full field of vision and is somewhat farsighted. Missing Hand Cutthroat is missing one hand he has replaced with his blade prosthesis. Trade-off areas. Attack/Effect PL 10, Dodge/Toughness PL 9, Parry/Toughness PL 10, Fort/Will PL 7. Points total 110. Abilities 56, Defences 19, Skills 17, Powers 7, Devices 2, Advantages 9. Equiv. PL 8. Helper(s): www.thebrotherhoodofthefin.net — this site is defunct but we had kept a backup of some texts, which are used in edited form in this entry. M&M stats by Pawsplay.